NASA has postponed tomorrow's scheduled launch of a commercial cargo mission to resupply the International Space Station for at least a day because of dangerously cold weather in Virginia. 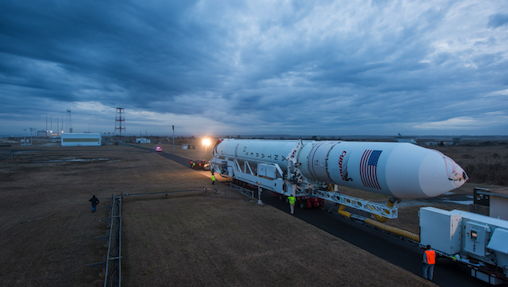 The Orbital Sciences Corp. Cygnus cargo spacecraft will now launch on Wednesday, Jan. 8, at the earliest, NASA said. The spacecraft will lift off from NASA's Wallops Flight Facility in Virginia atop an Antares rocket. Tuesday's weather forecast calls for rain and cold, a bad combination for a rocket launch. The forecast for Wednesday now calls for little change so NASA and Orbital Sciences may have to further postpone the launch. The craft is now slated for launch at 1:32 p.m. EST Wednesday. The Orbital Sciences craft's original Dec. 18 launch plan was postponed due to problems with a cooling system on the space station. Cygnus will carry some 2,780 pounds of cargo -- food, spare parts and a long list of scientific experiments, including 23 student-lead experiments -- to the space station. The craft will deliver, for instance, ants to the space station for a school project that seeks to compare the behavior of the ants in space to those living on Earth. NASA noted that researchers are also hoping to gain information on swarm intelligence, which could lead to solving complex problems like routing trucks, scheduling airlines or telecommunications efficiency. Liquids are being brought to the space station to be used in a study dubbed the Spheres-Slosh study. The liquid will be put into small, free-flying satellites to simulate how rocket fuel moves around inside tanks in response to motor thrusts used to push a rocket through space. NASA scientists hope that a deeper understanding of how rocket propellants act can help them find ways to improve fuel efficiency and thus lower the cost of industry and taxpayer-funded satellite launches. The Cygnus spacecraft also is carrying aloft equipment for an experiment focused on antibiotic drug resistance. Scientists hope the study will improve the efficacy of antibiotics and reduce bacteria's resistance to them.